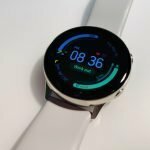 Here are some of the best and most popular fitness trackers and accessories on Amazon and their current prices. The Garmin Vivoactive 3 gives you most of the features you’ll need at a reasonable cost. 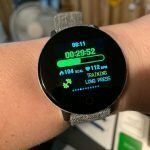 With a built-in GPS, quick replies to notifications (Android), the ability to connect with external sensors like chest heart rate monitors for accurate readings during resistance training, a wrist HR monitor for cardio workouts, Garmin Pay, and access to some of the best features on Garmin Connect, this is a no-brainer. Several colors to choose from in these Samsung Gear Sport replacement straps. Features quick release pins for easy changing. The Fitbit Versa is a fitness tracker released in 2018 that I was excited about because it has mass appeal as a smartwatch and fitness tracker and it’s a watch that has the ability to add so much more functionality over time through new apps. While app selection is a bit limited right now, I except to see much more over the next few months. The Versa has become my everyday watch due to its style, being so lightweight and comfortable, and its motivating features. For an affordably priced GPS fitness tracker I haven’t found anything better than the P1 GPS Running Watch. The heart rate sensor performed very well in my tests as well as the built-in GPS. 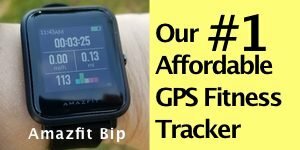 Unlike a lot of budget fitness trackers this one has a screen that can be seen outdoors. 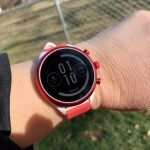 It’s definitely a watch to check out if you’re wanting a running watch as it supports several different modes. It also supports many other activities. 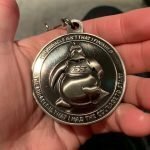 The Garmin Fenix 5s is pricey but it is my workhorse. 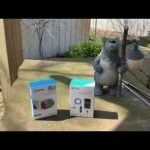 It’s the fitness tracker / GPS watch that I compare everything I test to because it’s the best on the market. I can always rely on it. 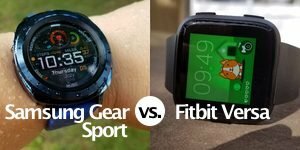 I just don’t think you’re going to find anything that does more or does it better consistently as a fitness tracker or hiking watch than the Fenix. If you enjoy hiking, outdoor adventures, need GPS navigation, advanced running metrics, durability and reliability the Fenix is it. My review of the Lintelek Fitness Tracker is one of the most popular pages on this site. There’s a lot of interest in it because of it’s very affordable price and consistently good reviews on Amazon. This is a very good entry level fitness tracker that won’t break the bank.